Spring is officially here when ramps are in! And when I think ramps, I think risotto. Sometimes, people think that risotto is difficult. But as long as you are willing to be patient, and don’t mind giving your stirring arm a little workout, risotto is a ridiculously easy way to have an elegant dinner. This recipe is for two, but you can easily make the recipe for more people by adhering to the following ratio: for every 1/4 cup of rice, you will need one cup of liquid. 1. Thinly slice the white ramp bulbs and roughly chop the leaves. Keep them separated. 2. In a saucepan, bring the stock up to a boil and then turn off the heat. 3. In a large Dutch oven or heavy-bottomed saucepan, brown the pancetta over medium heat until most of the fat has rendered and the pancetta has just begun to crisp. Spoon off all but one tablespoon of fat. Add the sliced white parts of the ramps and sauté them until they begin to turn translucent. Add the rice and toss the grains in the fat for about a minute or two. 4. When the rice grains begin to lose their opacity, add the white wine. When the wine has been absorbed, begin adding the hot stock, a ladleful at a time, while stirring constantly, until you have used all the stock or the rice has lost its chalky hardness and is perfectly al dente. This can take between 15-20 minutes. 5. When the rice is creamy and the grains are al dente, turn off the heat. Add the lemon juice and zest, the chopped green ramp tops and the butter. Incorporate everything into the rice. When the ramp tops have wilted, stir in about a 1/4 cup of Parmesan. Adjust the seasoning, adding a little hot water or more hot stock if the risotto seems to be a little thick. Serve immediately topped with more grated Parmesan. What do ramps taste like? What are they most similar too? I don’t have any experience with them. Risotto is great but it needs patience and love. It can’t be rushed. Ramps are amazing! I mean, a lot of people think they are a little overrated (and consequently overpriced), but they are available for such a short time that you just have to reach out and take advantage of them. A lot of people pickle them, but sautéed in olive oil or butter, they taste like a super delicate cross between garlic and green onions. Ramps are actually wild leeks, so they’re kind of like that. Maybe a little muskier. Risotto takes time, but the results are so worth it! You should! I love ramps saut�ed in a little butter and olive oil. With a fried egg. On garlic rubbed toast. Very good. Risotto is one of my favourites. Because you can take your time. As for ramps – yet another vegetable that we call something different over here (ie wild garlic). I wonder what would happen if I went into a local greengrocer over here and asked for ramps or scallions – they wouldn’t have a clue! I always wondered about that! Sometimes we call ramps wild leeks, and when I read some recipes calling for wild garlic, I never knew if they meant ramps or something else. Thanks for clearing up the confusion! Yum, yum, yum! I’ll have to remember this for next year, as it appears our ramps have disappeared already. (What a strange spring this is.) But we are getting lots of green garlic now which would be a nice substitute. They’re around for such a short period of time! Green garlic is a great substitute though. Am very much looking forward to rhubarb and fiddlehead ferns! Thanks, Kay! Risotto is a wonderful way to showcase spring vegetables! The great thing about risotto is that you can experiment with it in so many ways! Dude! We were channeling the same food craving! I agree: ramps (or wild garlic as they call them here) are ACE in risotto. I know! I think we probably made our risottos at the same time (I didn’t get around to posting until a few days later). Great cooks cook alike! 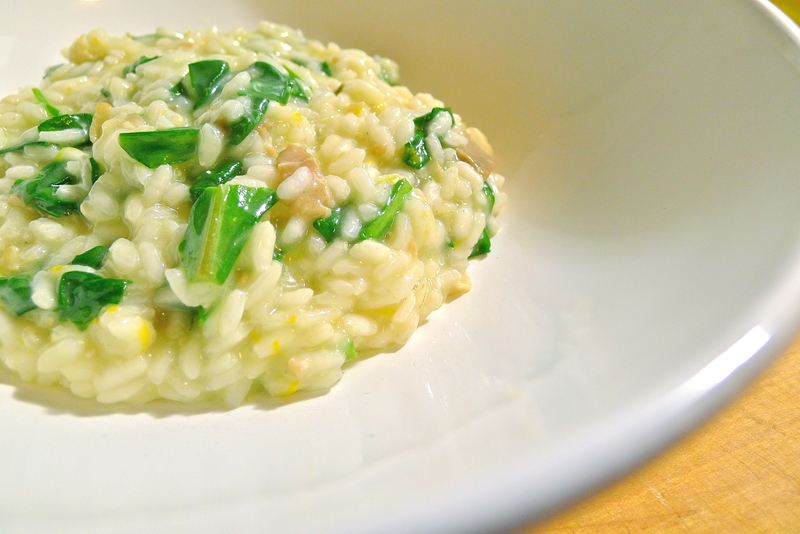 Ramps are totally awesome in risotto. Creamy, garlicky, yummy goodness. I am still dreaming about that little woodland cache your friend showed you. So lucky! Just found out too that what we call ramps, you call wild garlic. Good to know. I always wondered if wild garlic was ramps, green garlic or something else. I wonder why we call them ramps? Probably for the same reason we call aubergine eggplant — because Americans are weird!